I have passed this church for years without going inside. It sits within the urban area of Norwich, on the busy Earlham Road just before it disgorges its heavy load of traffic onto the A47, and I have always thought it rather a poor, beleaguered thing. It was only when I cycled from Bowthorpe, that most maligned of Norwich suburbs, and turned off the road into a little lane with cottages and the beautiful church in its graveyard, that I got a sense that Colney really was once a little village. Indeed, a map inside the church shows that the greater part of the parish is south of the Earlham Road, and is still intensely rural today. 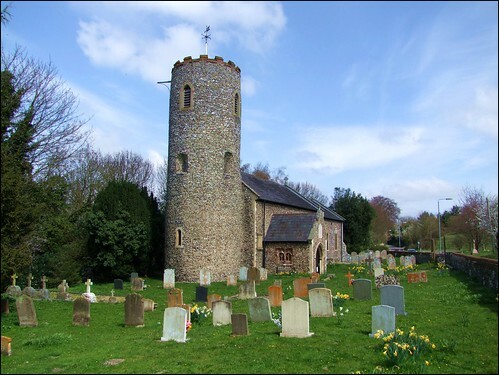 This is one of half a dozen or so round-towered churches in the urban area of Norwich, and unless you are viewing it from the main road it has the most successfully rural setting of any of them. The churchyard is a narrow one, and it is easy to forget that, until a few years ago, the route of the main road ran alongside the churchyard wall, and heavy traffic thundered past within a few metres of the church. A reminder of the traffic that once passed so close, and probably the best-known feature of St Andrew, is the headstone to John Fox recut and reset above the south porch entrance. It reads Sacred to the memory of John Fox who on the 20th December 1806 in the 79th year of his age was unfortunately killed near this spot having been thrust down and trampled on by the horses of a wagon. READER if thou drivest a team be careful and endanger not the life of another or thine own. The tower above is heavily restored, but there are double-splayed window holes, and there are also carstone quoins below in the west wall of the nave, both suggestive that this dates back to Saxon times. Otherwise, the church is generally 14th Century in character, albeit with the crispness of its 19th Century restoration. You step into a church which feels entirely Victorian, although very much with a fitting sense of its rural past. The great treasure of the church is the late medieval font. It is an exotic species - I do not think there is another like it in East Anglia. It features the signs of the four Evangelists carved characterfully, the winged lion, bull and eagle taking off with their scrolls in their mouths, the angel of St Matthew holding his in front of him. Facing east is a very good Crucifixion scene, but the most extraordinary panel is that which faces west. It shows a hooded figure standing next to what appears to be a man tied to a post with arrows sticking out of his body. Now, this being East Anglia, your first instinct might be that it is intended to represent St Edmund, but the imagery is so close to that of St Sebastian that I think that is who it is meant to be; and, given that this is such an unusual font, it raises the suggestion that this font did not come from Colney originally, and possibly not even from elsewhere in East Anglia. Norwich has contributed more than its fair share of familiar 18th and 19th century family business names, and perhaps the most prominent in the modern age is that of the Barclay banking family of Colney Hall. This was their parish church, and when Evelyn Louisa Barclay died at the age of 37 in 1899, the windows in the chancel were placed in her honour. They are worth more than a glance, because they feature Mrs Barclay and her eight children. The most charming window shows her at her reading desk, a baby on her lap and an infant on the floor, the six older Barclay children standing and listening attentively. They are in the height of late Victorian gravitas before it transmuted into the triumphalism of the years before and after the First World War. In the decades immediately before the Reformation, there was a great flowering in East Anglia of brasses for Priests, and there is one here, to Henry Alikok, who was Rector, and died in 1502. It is a chalice brass, depicting a chalice and host, to denote that the commemorated person was a Priest. It sits on the edge of a great expanse of orange tiles, which appear to have been painted. I assume that they are actually late Victorian, perhaps contemporary with the Barclay windows, and I couldn't help wondering what had been obscured. A memorial to William Scott is a reminder of the days of the Raj. He was a Cornet of the Bengal Light Infantry, and he died at Jullunder in India in the year before the Indian Mutiny. He was 23 years old. The inscription quotes Genesis, Shall not the God of all the Earth do right, which must have been small comfort to his parents, I think. Outside in the graveyard is another memory of an Eastern tragedy, this time a modern one, in the form of a memorial to a local woman who died in the Boxing Day tsunami of 2004. Here, it was hard to blot out the traffic on the busy road, or the vision of Bowthorpe across the fields. But two jays were obviously quite happy with the way things were. In recent years, these beautiful birds have followed their cousins the magpies into the cities. From being shy birds, they are becoming rather fearless. These two hopped from the churchyard wall onto the top of two adjacent 19th Century headstones, watching me with interest, dipping and tilting their tails slightly to find a balance. The sun came out, and their vivid buff and sapphire dress was jewel-like in this green of late spring. The tufts on their heads made their sharp eyes quizzical. It made a perfect photograph; but, of course, as soon as I lifted my camera, they launched themselves into the air, and were gone.